After arriving to Denmark I've had this record in heavy rotation, both in my head and in my music player. Therefore I though it'd be rather fitting to also write a review of it. I already wrote a little introduction piece about the band, which can be read here, but as you cans see, the introduction playlist I made largely features songs from their debut album Fruit. The Asteroids Galaxy Tour's first album was more instantly accessible, summery retro-pop. The second album Out of Frequency (2012) still has that distinctive psychedelic pop sound on it, but it also showcases the band as a much more ambitious project. The album opens with a mostly instrumental, brass-tinged "Gold Rush Pt. I", which then segues into "Dollars In The Sun", a catchy banger with a hip hop beat. Surprisingly the band then reprises their "Gold Rush" intro, this time as "Pt. II", which could've worked more effectively if placed later on the album but it's a great instrumental piece whatsoever. It is followed by the triumphant single "Major", which is one of their best and catchiest songs to date. Continuing with the poppier side of the band there's "Heart Attack", another single which has a very bubblegum pop feel to it - even disturbingly much so. Let's just say it's not exactly the bands finest four minutes. The title song "Out of Frequency", however, more than makes up to its predecessor, and has a classic '60s/'70s psychedelia feel to it. Its chorus also has an unusual 5/4 time signature which works perfectly in the song. "Out of Frequency" and the next song "Cloak & Dagger", the dark stomper that could be an indie Bond theme song, are two of the album's definitive highlights. The latter half of the album is kicked off by the lyricless little piece "Arrival Of The Empress (Prelude)" which flows into "Theme From 45 Eugenia" (45 Eugenia is an asteroid, in case you're wondering) which is one of the more ambitious tunes on the album, and is a wonderful step away from the "easier" sound of the likes of "Heart Attack" and "Major". The band doesn't let things get too progressive though, as they return to pop with the wonderfully saccharine "Mafia", which makes a great singalong song. "Ghost In My Head" is another stand-out moment where the group takes a slightly more serious tone, which is once again balanced with the feel-good track with a funny name "Suburban Space Invader" (which even refers to another, somewhat more widely-known Scandinavian pop group: "See yourself on the silver screen / Dancing queen, just seventeen") and the upbeat "Fantasy Friend Forever" which originally debuted on the The Golden Age EP. Finally comes the brilliant "When It Comes To Us" - another song that feels deliciously retro, yet fresh as well - which closes the album on a high note. Out of Frequency might lack Fruit's "easiness", but the album sees the band have much higher artistic aspirations and, other than "Heart Attack", sorry, the record is solid gold. The songs work perfectly together, and the band succeeds in balancing between experimental and accessible. 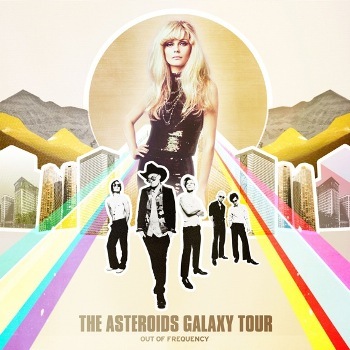 The Asteroids Galaxy Tour certainly is one of the most interesting pop soul/psychedelic groups out there. Try at least: "Dollars In The Night", "Major", "Out of Frequency", "Cloak & Dagger"